Around half an hour after I posted part one of this blog you’ve never heard such a commotion in the chicken run. It made the dogs go crazy, even the dogs in the neighbours barking too. On investigation I found George strutting around the chicken run and the hens taking off from their roost like a possum was in their chicken house. Alarmed, you bet I was. I’d cleaned the house earlier this morning I wanted to see what havoc was being reeked. And this is what I found. No word of a lie. 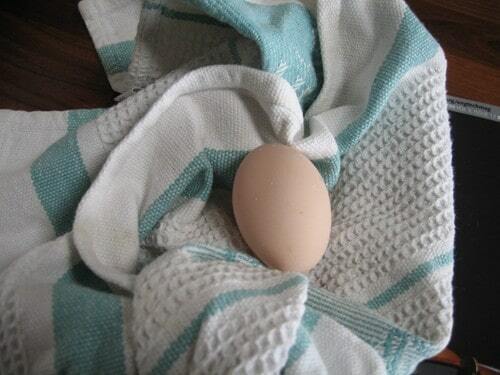 It seems that deriding my chickens lack of productivity on this blog had the powerful effect of getting them to lay me an egg. That’s my girls! Don’t ask me which one laid it though. By the time I’d got my wellies on and legged it down the garden all the chucks were flapping their wings in the pen so I missed who was the last to leave. All I can say is the George had a glint in his eye and I know he didn’t lay it! I was so excited but then it dawned on me, no-one was going to believe what happened. Just so you know there is an independent (well almost) assessor on these matters MT is working from home today so I bowled into his office to plead my case. I have an egg. 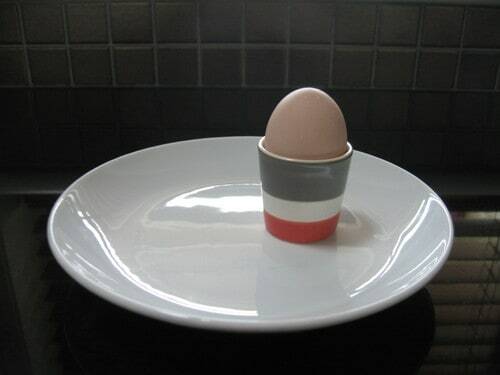 It is the most beautiful egg I’ve ever seen. Small but perfectly formed – warm to touch – although it nestled up close to the fake egg it’s most definitely the real thing. Just in case you may have missed the first view of this earth shattering moment in the Domestic Executive Menagerie here’s some more pictures to keep you going. I’m off for a lie down all this excitement is simply too much for a Friday. It’s the one on the left! See that glint in George’s eye! It’s own special plate and cup! So who do you reckon did it? I raised chickens for years but not heard of a correlation between a larger, redder comb and which hens might be laying??? Clue me in! 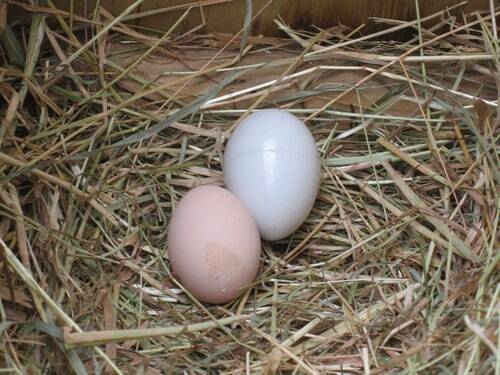 By the way, your chickens are BEAUTIFUL and congratulations on that first egg! 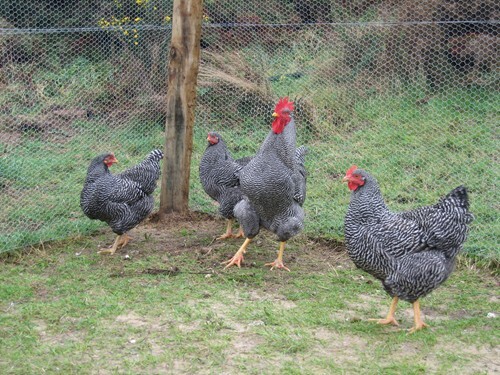 Hi Ranchmum – thanks for the interest in to the chooks. I’m still a newbie to the hen keeping game (can you tell?!). 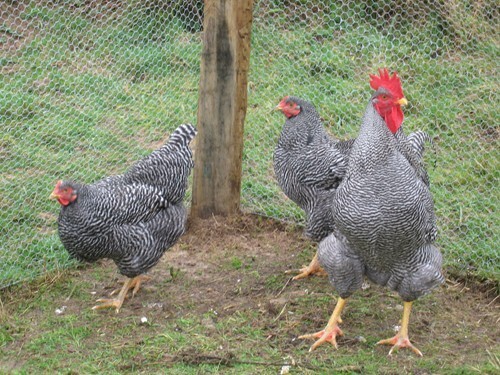 Apparently my neighbour and other chicken keeping friend have both told me that as the hens grow the fact their combs grow and in the case our ours are a bright red is a sign that theire maturing to laying point. I’m a trusting sort of girl so never thought to question. 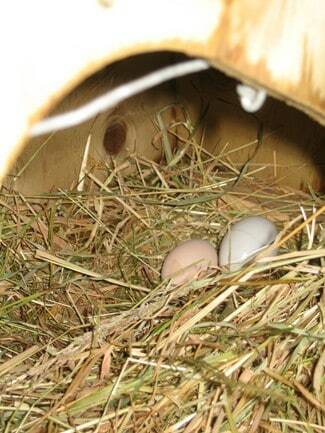 I’ll get on the research case though and see if this is a hen keepers tale or whether there’s any truth in it. Keep tuned and I’ll update the comments.